Babies everywhere! Or i’m apparently reaching that age where i have found myself constantly baby shopping for friends suddenly… So is it any surprise that Jill Fehrenbacher, of Inhabitat, in the midst of her pregnancy has launched Inhabitots, the latest addition to the Inhabitat family? Also, the new logo for the calm blue site is an adorable Owl with child! 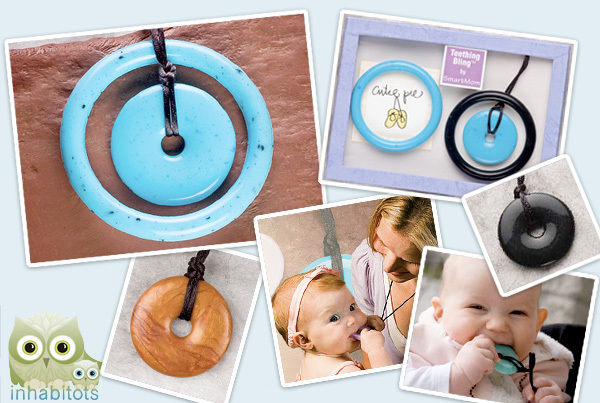 While many of the products there are right up our alley (and have shown up on NOTCOT previously) ~ they are eco-friendly, clean and modern… and my latest discovery on Inhabitots to add to the backup list for new-parent shopping is what is a bit scarily called “Teething Bling” by Smart Mom Jewelry. If you pick the subtler hues, its not a bad necklace/bangle, and the nice thing is, it’s completely safe for your child to teeth on, and saves your usual jewelry from the nibble marks. My only worry is… will this help condition your baby to think its ok to chew on jewelry in the long run? What is the price on the theeting necklace? and my additional worry…if you let the kid chew on it while its attached to you (bottom center), surely you just get yanked around/strangled?